The High Court on Monday granted a sale order to the $610 million en bloc sale of Goodluck Garden, but not before criticising marketing agent Knight Frank, the collective sale committee (CSC) of Goodluck Garden and the CSC’s lawyers Rajah & Tann, for how they handled the sale. 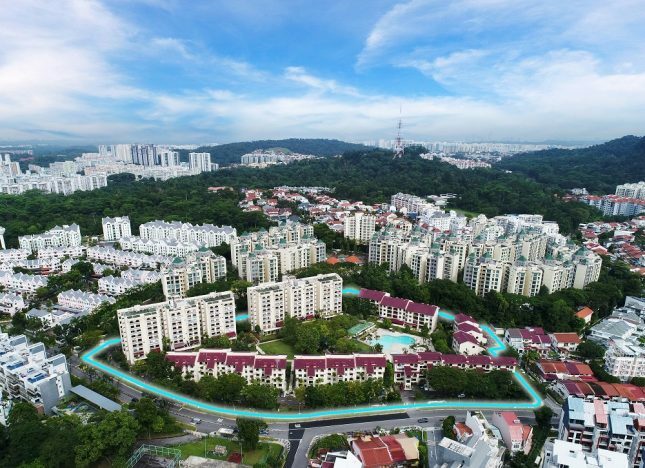 Knight Frank Singapore announced in March 2018 that Goodluck Garden, a 210-unit residential development located along Toh Tuck Road, has been sold collectively to the Qingjian Group of Companies for $610 million. But objection by seven minority members led to the sale going before the High Court. Based on a potential Gross Floor Area (GFA) of 46,840.08 sq m, the sale price translates to a land price of approximately S$1,210 per square foot per plot ratio (psf ppr). Knight Frank said in March that due to a high development baseline, a Development Charge will not be payable for the 10% bonus balcony and this will lower the land price to S$1,100 psf ppr. Goodluck Garden is a condominium comprising eight blocks with a total of 208 residential units and 2 commercial shops. The apartment size ranges from 95 sq m to 182 sq m, and the two shops are 30 sq m and 91 sq m respectively. The development has a site area of 33,457.2 sq m (approx. 360,130 sq ft). It is slightly elevated with a frontage of approximately 300 metres onto Toh Tuck Road. Nested in a coveted residential area, the development, which is within minutes’ walk from Beauty World MRT Station, is close to reputable schools and wide variety of amenities. Over 80% of the owners consented to the en bloc sale four months from the first signature on 9 September 2017. A public tender was then launched on 26 January 2018 and closed on 7 March 2018. As of the close of tender, owners of 169 out of 210 units making up 81.93% of the total strata area and making up 81.35% of the total share value in Goodluck Garden consented to the collective sale. The dissenters in submitting a $637 million valuation by Asian Assets Allianz, disputed the $542 million valuation of the property by Colliers International. They also argued that the fact that two members of the CSC had relatives owning property in Goodluck Garden, which amounted to an actual or potential conflict of interest. The judge in dismissing both contentions said the the apportionment of sale proceeds of Goodluck Garden was fair. The collective sale committee received information from the authorities before the tender closed that no development charge would be applicable on the property. The High Court Judge Woo Bih Li said the CSC should have extended the tender by at least one week after getting this new information on Development Charge, so as to give more time to inform bidders and sought owners to decide whether to raise the reserve price. Knight Frank previously gave homeowners several development charge estimates (the highest being $63.19 million), and launched the tender before obtaining verification from the Urban Redevelopment Authority (URA). Each owner of Goodluck Garden stand to receive a gross sale price of approximately $924,000 to $3.51 million upon the conclusion of the sale.